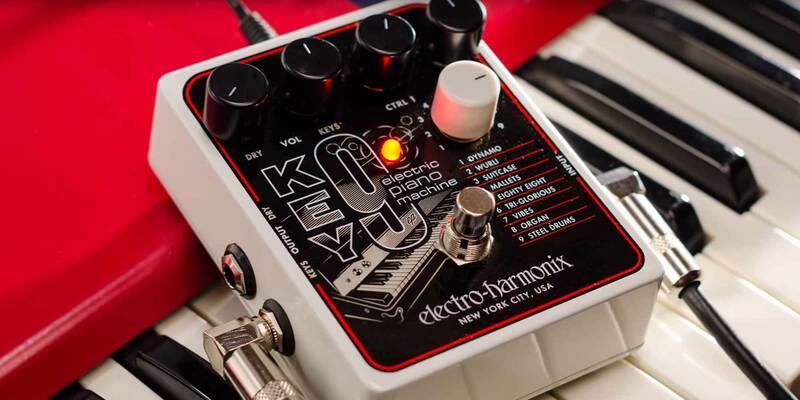 Following in the wake of the much-celebrated C9 and B9 Organ Machine pedals, Electro-Harmonix announced this week the release of a new electric piano emulation effect dubbed the KEY9 Electric Piano Machine. This pedal offers nine piano models including Dynamo, Wurli, Suitcase, Mallets, Eighty Eight, Tri-Glorious, Vibes, Organ and Steel Drums that cover all your vintage piano needs and then some. Like the C9 and B9 did with classic organ sounds, the KEY9 promises to transform your guitar tone into an electric piano to fill those Rhodes, Wurli and other vintage keyboard needs. According to a press release from Electro-Harmonix, the KEY9 includes dry and key controls to blend the original tone of your guitar or other instrument with the full-on sound of the piano sound, as well as individual CTRL knobs to cater different parameters for each setting. The KEY9 has not hit the street as of the posting of this article, but should be shipping to retailers shortly. Hear the nine settings of the new KEY9 in action in the video below from Electro-Harmonix. We particularly like the Steely Dan tribute at about the 2:22 mark and the Gotye cover at 3:18.